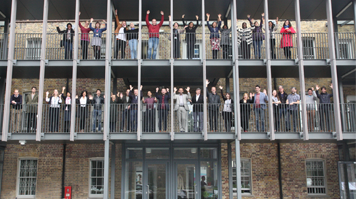 London South Bank University’s (LSBU) Clarence Centre for Enterprise and Innovation is celebrating three years of successful enterprising activity. Since opening in 2013, the Clarence Centre has provided a focal point for the University’s enterprise and innovation activity on campus. It is a home for LSBU student and graduate entrepreneurs and the Research, Enterprise and Innovation team, alongside 18 small and medium-sized enterprise (SME) tenants. It provides a unique environment for LSBU students and alumni entrepreneurs to work alongside SME tenants, offering opportunities for skill development and start-up support. Over the last three years the Centre has worked with over 13,000 students and graduates who have participated in curricular and extra-curricular enterprise activity. LSBU has also supported 60 new business start-ups through the Centre’s programmes this year. Having already received a Regeneration Award from the esteemed Royal Institute of Chartered Surveyors in 2015, the Centre has also just received global recognition as an Outstanding Emerging Entrepreneurship Centre at the Global Consortium of Entrepreneurship Centres Conference 2016.